Families, schools and communities are celebrating in the Pacific Northwest. Whitworth and Gonzaga universities will welcome a total of 16 new Act Six Scholars to the incoming class of 2021. The eight scholars entering Whitworth and eight entering Gonzaga are among 100 Pacific Northwest and Midwest students to receive full-tuition, full-need college scholarships as members of the latest Act Six cohort. Selected through a rigorous three-month competition among more than 1,000 applicants, these diverse student leaders were selected for their commitment to serving on campus and at home, passion for learning, eagerness to foster intercultural relationships, and willingness to step out of their comfort zones. The media and public are invited to attend the community celebration to recognize the newest Act Six scholars from Spokane on Monday, Mar. 13, at 6 p.m. at Gonzaga Preparatory. Recruit and Select: Locally recruit and select diverse, multicultural cadres of a region’s most promising emerging urban and community student leaders. Train and Prepare: Intensively train these groups of students in the year prior to college, equipping them to support each other, succeed academically and grow as service-minded leaders and agents of transformation. Send and Fund: Send the cadres together to select faith- and social justice-based colleges on full-tuition, full-need scholarships. Support and Inspire: Provide strong campus support, ongoing leadership development and vocational connections to inspire scholars to serve their home communities. Launched in 2002 by the Northwest Leadership Foundation (NLF) in Tacoma, Act Six seeks to develop urban and community leaders to be agents of transformation on campus and in their home communities. 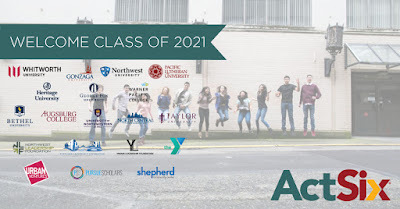 Since the program’s inception, 90 cadres of ethnically diverse and mostly first-generation, low-income Act Six scholars from Tacoma, Seattle, Portland, Spokane, Yakima Valley, Chicago, Indianapolis, and Minneapolis-St. Paul have enrolled at twelve Northwest and Midwest colleges and universities. Other institutions receiving Act Six Scholars this year are George Fox University, Heritage University, Northwest University, Pacific Lutheran University, Warner Pacific College, Augsburg College, Bethel University, University of Northwestern-St Paul, North Central University, and Taylor University. To date, 83 percent of the 615 scholars who have started college have graduated or are still enrolled – reflecting graduation and retention rates that far exceed national averages. Several Act Six scholars are assuming significant leadership roles on campus, including numerous club presidents, 10 student government presidents and a board trustee. Nearly two-thirds of Act Six alumni have brought their degrees back home to serve and lead in their communities, and more than 30 percent are pursuing or have earned postgraduate degrees. Together, these passionate and collaborative alumni are leading in their communities to live out the Act Six mission. After being chosen for the program, scholars begin an intensive six-month training program that involves weekly meetings with Act Six staff, retreats and campus visits. Learn more about Act Six online at www.actsix.org. Marianne Hansen, director of admissions, Whitworth University, (509) 777-4347 or mhansen@whitworth.edu. Julie McCulloh, dean of admission, Gonzaga University, (509) 313-6591 or mcculloh@gu.gonzaga.edu. Francis Chau, Act Six Spokane program supervisor, YMCA of the Inland Northwest, (509) 720-5613 or fchau@ymcaspokane.org.